In the Open division of last weekend’s Copenhagen Open Classic, Sunday’s third and final round looked to be a showdown between two Danes in their nation’s capital: the 996-rated Jeppe Ask Sørensen held a two-stroke edge over the 1031-rated, 11-time Danish champion K.J. Nybo. There was even less daylight between the two Open Women’s leaders, with Eveliina Salonen being just one shot clear of fellow Finn Sini Lindholm. However, the nature of both contests changed drastically before the last putter hit the chains. Sørensen eventually fell behind not just Nybo, but Sweden’s Linus Carlsson and Norway’s Øyvind Jarnes, whom Sørensen had led by six and seven strokes, respectively, at the round’s outset. In the end, Nybo’s 23-under par 172 earned the comeback win, while Jarnes and Carlsson’s twin 21-under par 174s officially tied them for second in the PDGA books. In a playoff to decide who would get to take home the second and third-place trophies, Jarnes emerged victorious after four holes. For the Open Women, the 926-rated Salonen had a hot third round and shot a 969-rated even par, which contributed to her event-winning 10-over par 205. That score easily bested Lindholm’s second-place 22-over par 217. “It feels nice to win, especially because my early season wasn’t so good,” Salonen said. On Sunday morning, Sørensen had yet to be bitten. During what he called “a magic Saturday,” he’d played bogey-free and averaged just under 1038-rated golf—42 points over his current rating—during his first two rounds. Sørensen’s dream-worthy play had put him at 20-under par and atop Sunday’s five-player lead card. Due in large part to his 1061-rated second round, Nybo was just behind at 18-under. Further back were Carlsson and Tomas Rosenqvist at 14-under par and Jarnes at 13-under par. Rosenqvist, who won the Euro Pro Tour’s Strudengau Open just two weeks before, had hurt his shoulder during play the day before and quickly fell out of contention for the podium. As for Sørensen, Nybo, Jarnes, and Carlsson, it was a battle to the last. The first few holes saw no major moves among the eventual top four. 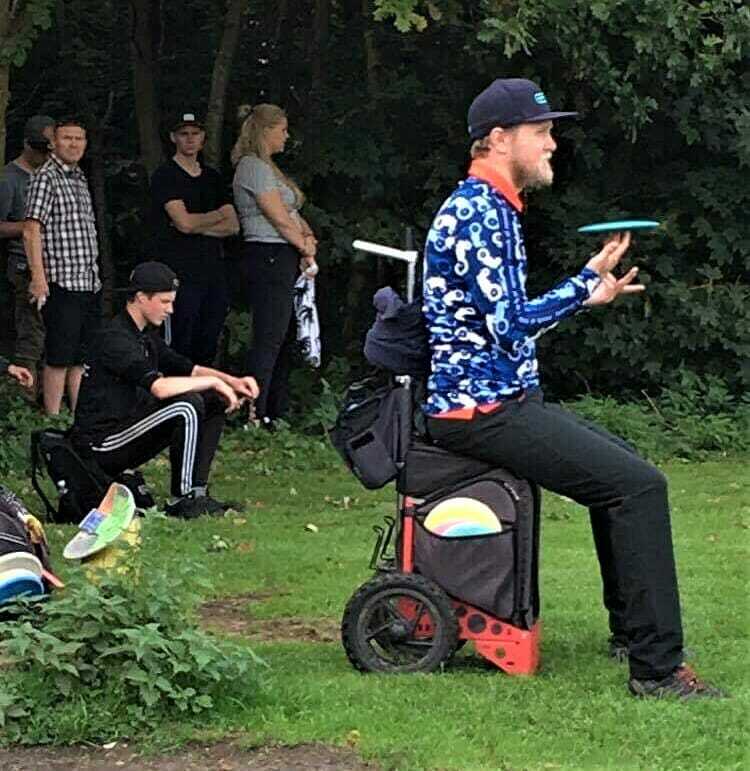 After all parring hole 1, holes 2 through 4 found three players take lone birdies—Sørensen got 2, Nybo 3, and Jarnes 4—while the others parred. The par 5, 233-meter (764-foot) hole 5, however, was where the sparks began to fly. There, Sørensen found his first bogey of the tournament, and it proved to be a costly one. Nybo and Carlsson both carded birdies, while Jarnes got an even bigger boost. The situation was less inspiring for Sørensen. In just one hole, his two-stroke lead over Nybo had turned into a tie. His mistake also opened the door for Jarnes and Carlsson, who now stood at 16- and 15-under par, respectively, and that door would only continue to open wider. By hole 11, Sørensen had tossed in two more birdies, but also collected three more bogeys. In the same span, everyone else in the leading quartet had added three birdies apiece and had yet to see red on their scorecards. Though starting the day two strokes back of the lead, Nybo now had a comfortable four strokes over Jarnes and Sørensen and five over Carlsson. While Jarnes got the closest to Nybo by pulling within one on hole 15, gaining four strokes in seven holes on a player the PDGA ranked fourth in the world last July proved an insurmountable task. Going into the 217-meter (712-foot), par 4 hole 18, Nybo had regained most of his cushion and led the field by three strokes—enough so that even his OB-assisted bogey on the hole gave his competitors little hope for a win. Still, the battle between Jarnes, Carlsson, and Sørensen for the other two spots on the podium offered all the drama a gallery could hope for. Jarnes came into the last hole with a tenuous one-stroke gap over the tied Carlsson and Sørensen. After the trio’s second shots on the par 4, Carlsson was 15 meters (50 feet) from the pin, Sørensen was on the circle’s edge, and Jarnes was even closer. Carlsson, who claims to like playing under pressure, proved his affinity for nerve-racking situations by sinking his monster birdie putt. Though much closer to the basket than Carlsson had been, neither Sørensen nor Jarnes handled their own pressure quite as well, and neither player connected on his own birdie effort. That put Carlsson into a tie for second with Jarnes while Sørensen—who later confessed that he was “super sad and frustrated to miss out on a big chance”—slipped into fourth place. 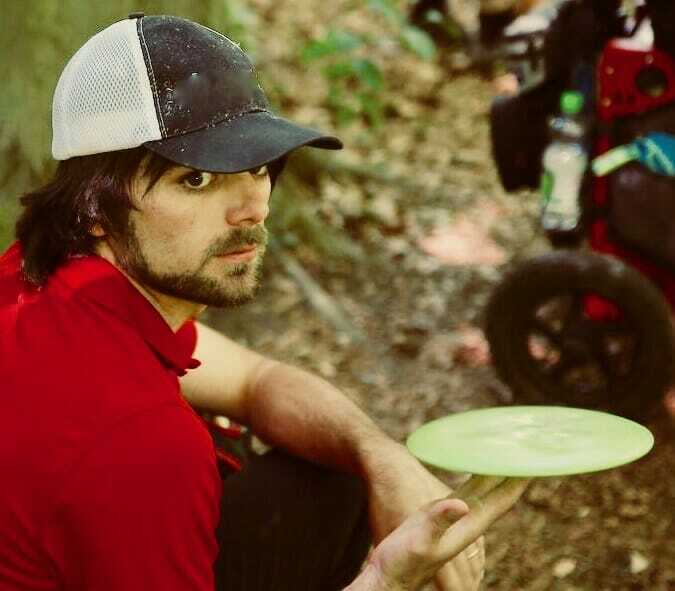 That confidence will be important to find as Nybo, like Jarnes, takes on the world’s best at next week’s United States Disc Golf Championship. Comments on "Nybo Comes Back For Copenhagen Open Classic Win"